As we returned to the Air Show today- so did the rain! We were stuck in some absolute downpours today. I’d like to say it’s Washington state’s way of increasing our presence here in London – but I here it’s sunny and in the 80s back home! That theory isn’t working for me anymore! All kidding aside – we had another phenomenal day – and continued to meet with some of the top executives in aerospace, including Boeing President and CEO Jim McNerney. 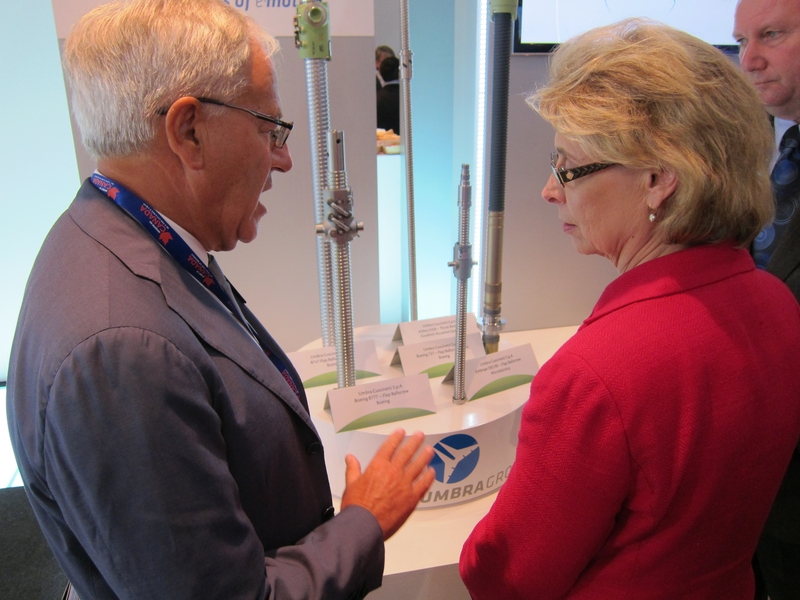 Another highlight at the show today was meeting with folks with Pacifica Engineering. 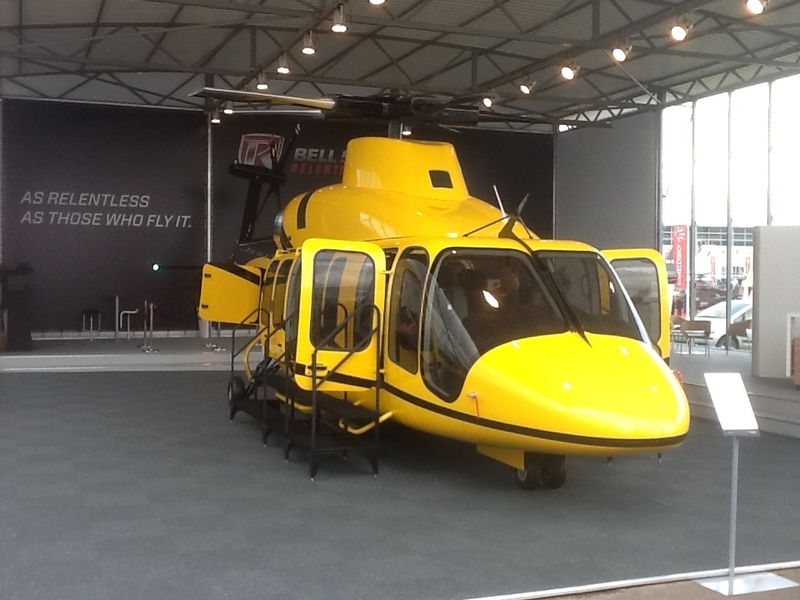 This is a company based in Bothell which announced today that it was selected as a key supplier for Bell Helicopter’s new 525 Relentless program. A picture of the helicopter is below. More good news came from Bellingham-based Heath Tecna – which announced that the company has been selected to replace bin interiors for Boeing 737 and 757 aircraft. Good news for the company – and good news for you! Their design means 30 to 40 percent more overhead bin capacity for you and other passengers! 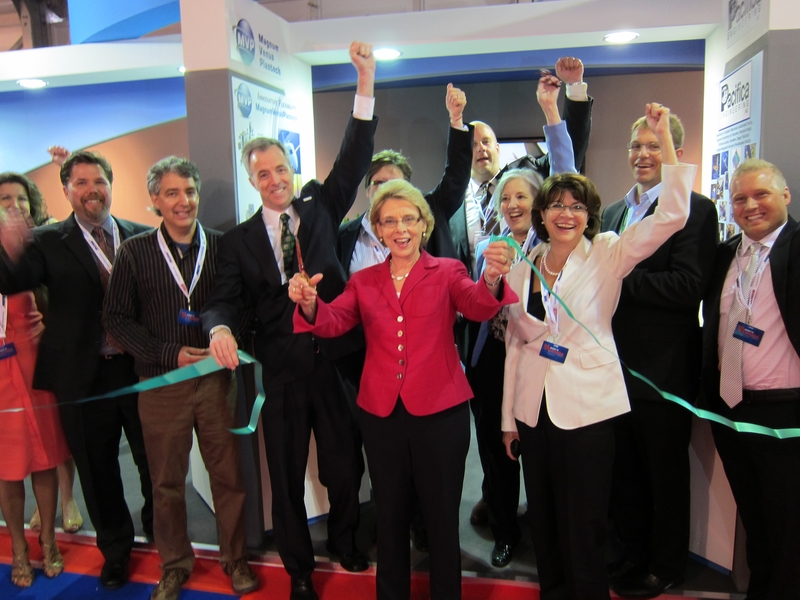 And since last year’s visit to the Paris Air Show – Heath Tecna has added 170 jobs! Amazing! Both of these announcements underscore the skill of our world class supplier base – as well as the importance of events like the Farnborough Air Show where our businesses can continue to build relationships that literally serve the world. 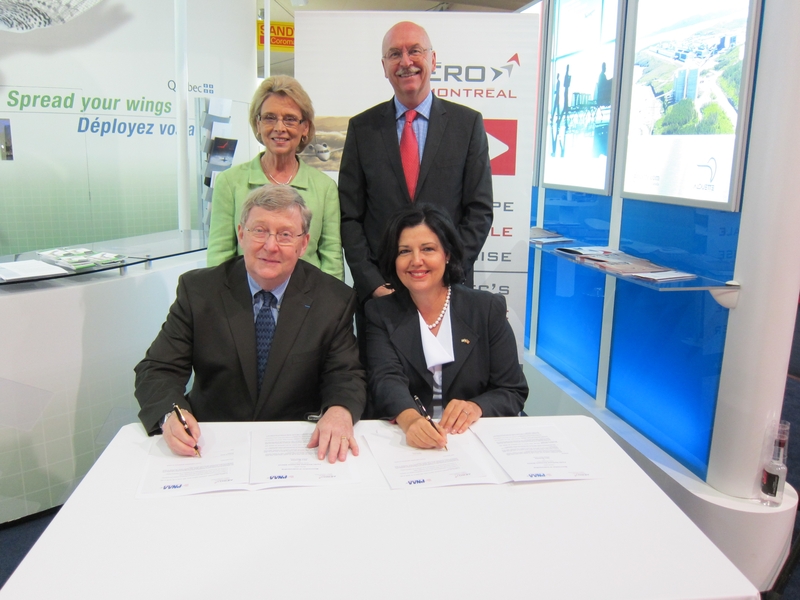 I should also mention an important memorandum of understanding that we signed at the Air Show – between the Pacific Northwest Aerospace Alliance and Aéro Montréal, Québec’s aerospace cluster. The agreement will allow the organizations to exchange information about programs and initiatives, and their respective member’s needs and capabilities – and will ultimately help both organizations grow our respective region’s aerospace industry! This afternoon – we switched gears a bit – and turned our attention to our state’s high tech sector. We traveled to Paddington to introduce members of the trade mission delegation to executives at Everything Everywhere, the largest mobile network operator in the United Kingdom, serving 28 million customers. This was a good introduction meeting that I’m confident will lead to new partnerships and expansion opportunities. I wanted to share a few more pictures from the trip. The first is the ribbon cutting ceremony at the Washington state exhibit inside the U.S. Pavilion. A lot of excitement! I’ve also included a picture following the MOU signing with Dassault – as well as a couple taken while stopping by Umbra Cuscinetti – which announced a significant expansion in Washington state! Speaking of great results – what a day for Washington state from Farnborough! Not only did Boeing announce a record deal for the 737 MAX (great news for our suppliers!) – we also had a string of announcements that will lead to additional new jobs in Washington state. 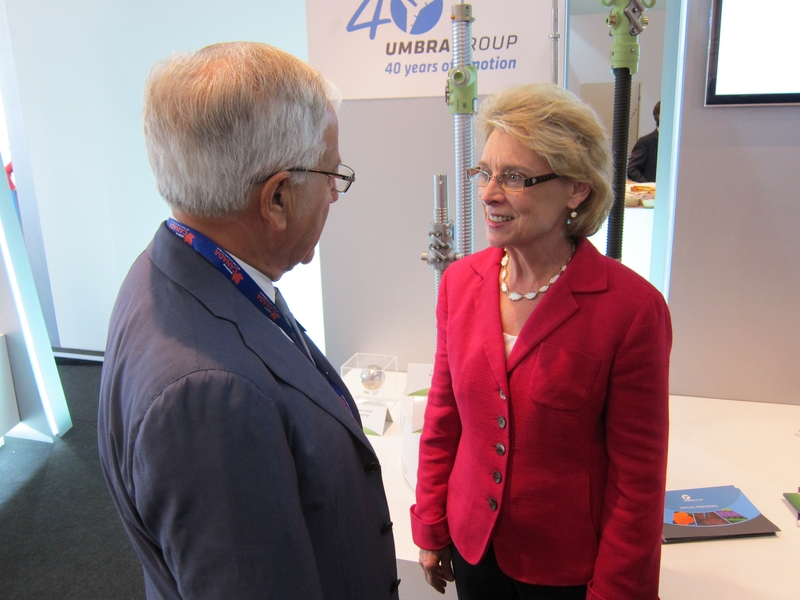 Watch the video below – this is me congratulating Umbra Cuscinetti – an aerospace supplier that announced today it is expanding in Washington state – and adding 100 new employees. Fantastic news! Today we also learned that Washington based Aerojet will be expanding its space rocket engine business into Europe. The company already employs 450 high tech workers at its Redmond offices. The new European venture is expected to provide key subcontracted work for its facility in Redmond, providing not only revenue growth but job growth for the region. More great news! Fokker Aerostructures also informed me during a meeting today that it plans to add 60 engineers to its offices in Mukilteo! To top off the afternoon – Dassault Systèmes signed an agreement with the Washington Board for Community and Technical Colleges – which will make CATIA, Dassault Systèmes’ computer-aided design (CAD) program, available to the state’s two-year colleges at a deeply discounted price. The agreement will allow thousands more students to train on the cutting-edge software required by Boeing and other aerospace employers. Dassault Systèmes’ has agreed to sell 1,200 educational-use licenses of the 3D training software to the state board for $9,150, or $7.63 per license. Individual colleges have paid between $200 and $350 per license in the past!! That’s tremendous savings – thank you Dassault! We do it again tomorrow! Comments Off on Big News! A group of us representing five companies and the Department of Commerce split off from the main delegation who were headed to Farnborough today, and instead, we ventured out of London to the town of Warick, where we visited Warwick Manufacturing Group. I have to say… what an amazingly fascinating place! Definitely one of my favorite stops on the tour so far. WMG was founded in 1980 to help invigorate UK manufacturing. It is considered an academic department of the University of Warwick and employs 280 full-time as well as a host of industry partners and advisors. This was a great opportunity to learn more about how WMG manages their manufacturing R&D and Technology transfer, and expose our companies working across similar technologies and platforms to new partners in the UK. We heard from experts working across Digital Media, Marketing Systems, High Value Manufacturing, future of Healthcare devices, Digital technologies and user interaction, virtual business eco-systems, and a host of other intriguing programs. We spent a full day understanding the WMG’s strategy as it relates to these program areas, and exposing the Washington state companies who have similar backgrounds and expertise, to examine partnering opportunities. There are plans underway already for continued connections post-trip. I look forward to being part of those discussions, and even seeing how the state of WA can utilize technologies to partner and strengthen our own ecosystem and clusters. I must say, this has been an extremely long 6 days already for me! You hear about how demanding the schedule is for these missions, and I don’t think you can really comprehend it, until you are here, going through it, being in the meetings, seeing everything and everyone come together. I am so impressed, and proud of the Governor and our team for a job well done! I look forward to getting into Farnborough for my first peek tomorrow morning… starting early! and going through the night… this is what it’s all about. We had a fascinating visit to the Airbus A380 wing box production facility just across the border in Wales. If you’re not familiar with the A380, this is Airbus’ superjumbo, double-decker airplane. And, as a lady at the pub last night described it, it’s “massive!” The wings are too, of course–each one is 36 meters long! Similarly to a place much more familiar to me, the Boeing Renton Plant, airplanes have been built in Broughton since WWII. British Aerospace built the Wellington Bomber here. But, the A380 wing factory is much more recent, opening in 2003. 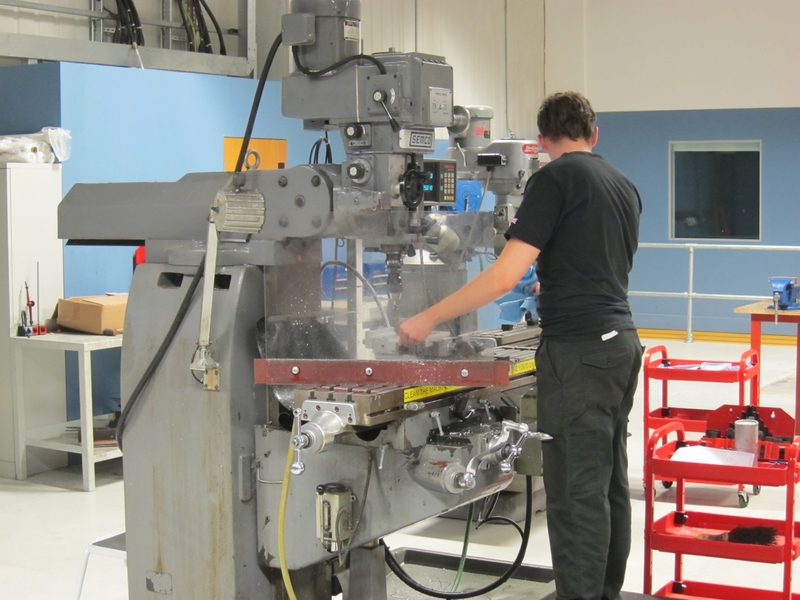 It is a heavily automated production process involving giant tools custom-designed by Mukilteo-based ElectroImpact. By the way, Airbus’ uses a incredibly complex logistical process in getting the A380 wings and all it’s other giant component parts to their final assembly location. To see this trains, planes, and automobiles story, watch this video: http://videos.airbus.com/video/iLyROoafvDZB.html. Airbus presents an additional opportunity for Washington’s 700+ aerospace suppliers. The company currently spends $12 billion buying products from suppliers in the US and they want to grow that investment by billions in the coming years. Since we’re home to the largest aerospace supply chain in the country, we’re a natural to gain more of that business. In fact, Washington is already the 3rd most important state to Airbus in terms of the number of suppliers ( we have 25 Tier 1 suppliers) and 5th in terms of dollars spent (approximately $200 million annually). A few of us had a strategy session with the head of North American procurement and we committed to working together to help capture this opportunity for Washington companies. I look forward to building this relationship and further diversifying our aerospace industry. Now we’re off to London and preparing for Farnborough! Cheers! Comments Off on Expanding Opportunities! Day 3 – feeling good! Day three and the trade mission has already been a success! We started in Ireland where the message is simple—Ireland wants to do business with Washington companies, and the time is now. The economic recovery of both regions depends on trade and new investment and between us we have the opportunity to kick-start that conversation. I’ve been asked why Ireland, a country with a smaller population than the US, is a valuable partner. The reason is simple—it’s a country that aligns with our Washington values and it’s the entry point for the EU market. We can’t afford to ignore the opportunities there. We met our goal of introducing Washington state to the people and the government of Ireland. In a meeting with the Prime Minister I was able to share with him the impressive Washington companies that also call his country home—like Boeing, Microsoft, Amazon, Blue Nile, Popcap Games, Big Fish Games, and so many more. In addition we launched a very exciting project with Open Hydro, one of the few designers and builders of tidal wave energy. They are partnering on a project with Snohomish County PUD that promises to be truly groundbreaking in providing clean energy (and the first tidal energy in the US) to Washingtonians. In an unprecendented opportunity, our aerospace delegation visited Bombardier in Belfast where the message was simple—they want to do business with Washington state suppliers. Our message is simple as well—we want to do business with them! Finally we ended our third day with visits to Mukilteo based Electro Impact and Airbus. In Wales, Electro Impact is building the wings for the A380. An impressive factory, Airbus too is looking to partner with more strategic and smart companies and we are ready to help make those connections happen. As evidence of our success we are already seeing deals take form and agreements take hold. The value is clear—in these tough economic times when we are trying to rebuild our economy through a variety of means, we must be out knocking on doors and reminding people around the world that Washington is among the best states to do business and we are ready to make that business happen! Comments Off on Day 3 – feeling good! While I have a few minutes – thought I’d share a few more pictures from the trip. 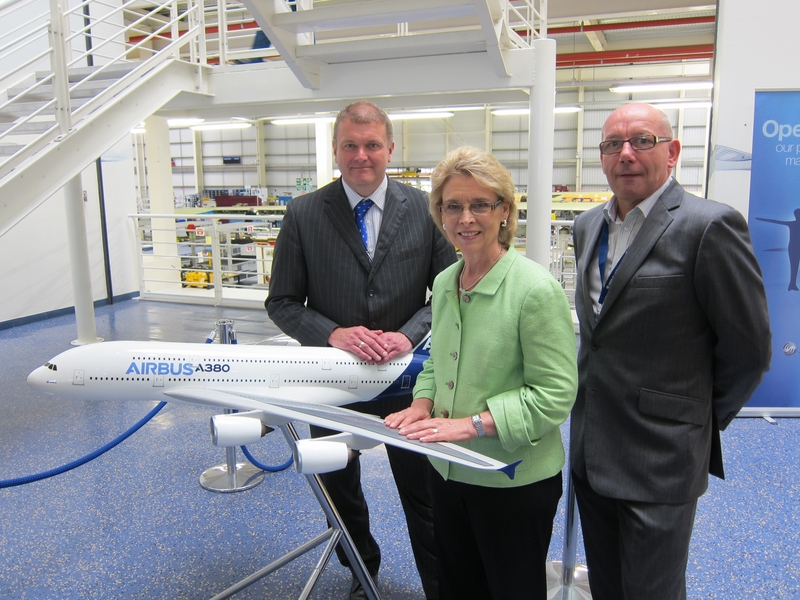 Today – I introduced our aerospace delegates to top executives at Airbus. I think very few Washingtonians realize that we have 720 aerospace supply companies in our state (up 30% since 2005!!). Of course their value is immeasurable to Boeing – but these companies also serve other plane manufacturers around the world. Our meetings with Bombardier and Airbus will no doubt open new doors for these delegates. Couldn’t be more pleased! Also below are some pictures from our tour of Electroimpact. This company is an aerospace supplier based in Mukilteo that not only supplies Boeing, but designs and builds the massive machines that assemble the A380 wing. Amazing to consider that we have talent from both sides of the Atlantic helping our state economy grow! Boeing isn't only local aerospace company hoping for Farnborough splash .